On Christmas morning of 1920 the residents of Cheraw received a novel gift from local pharmacist John Ladd, who opened the town’s first movie theater on that day. Ladd called the silent movie house on the Town Green the Lyric Theater, charging visitors 11 cents a ticket. Legend has it that Cheraw native Dizzy Gillespie got a job at the Lyric catching young people sneaking into the theater – after he was caught doing the same thing. In 1929 people were treated to the theater’s first talking picture, The Broadway Melody. Ticket prices jumped to 25 cents by the beginning of WWII, and the venue became known as the Cheraw Theater. The business continued to draw audiences through the decades, though it changed hands several times. By the 1980s the theater was called the Cheraw Cinema, and the brick building which once created such a buzz on a Christmas morning in 1920 closed its doors in 1987. 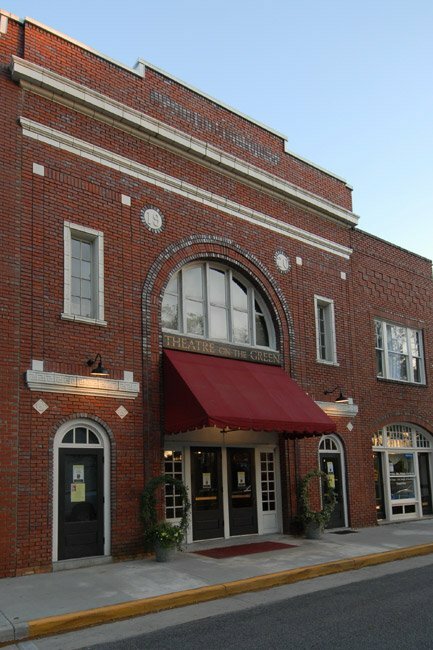 The following year the building was purchased by the Cheraw Development Corporation, and the old movie house reopened as the Theatre on the Green, a performance arts center and community gathering place. SCIWAY thanks Cheraw’s Director of Tourism and Community Development, David Sides, for the above photo and much of the information.